To evaluate the usefulness of Lab Guide, an educational lab values app created by Texas Tech University Health Sciences Center in Amarillo. The app is geared toward medical students. For most medical students, beginning clinical rotations is like being thrust into a completely different, yet exciting world. Gone are the days of lecture and endless hours in the library, instead replaced by seeing patients, performing physical exams, and learning to interpret lab values. 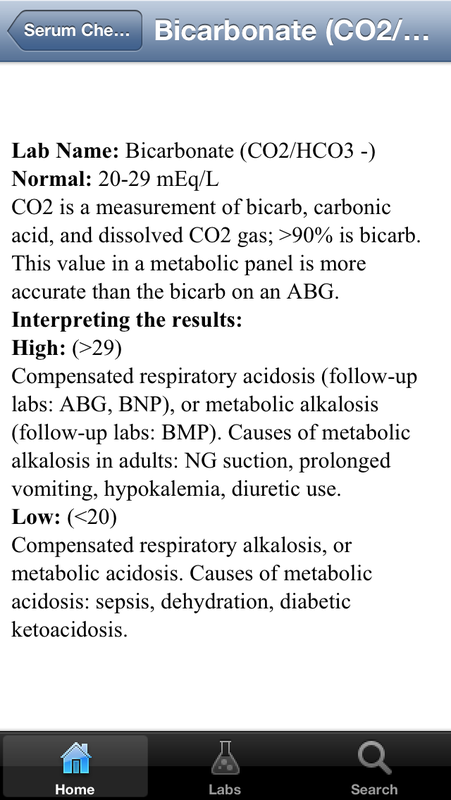 At first, learning normal lab values and the significance of abnormal values in clinical context can be a formidable challenge. Texas Tech University Health Sciences Center at Amarillo has developed an app to help medical students master common lab values, edited by board-certified faculty at the institution. 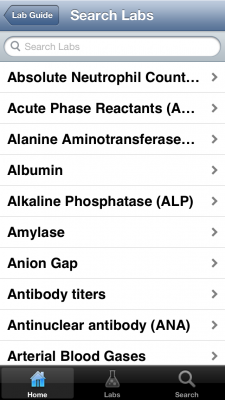 This app is a no-frills reference guide — a simple list of lab values and their explanations. 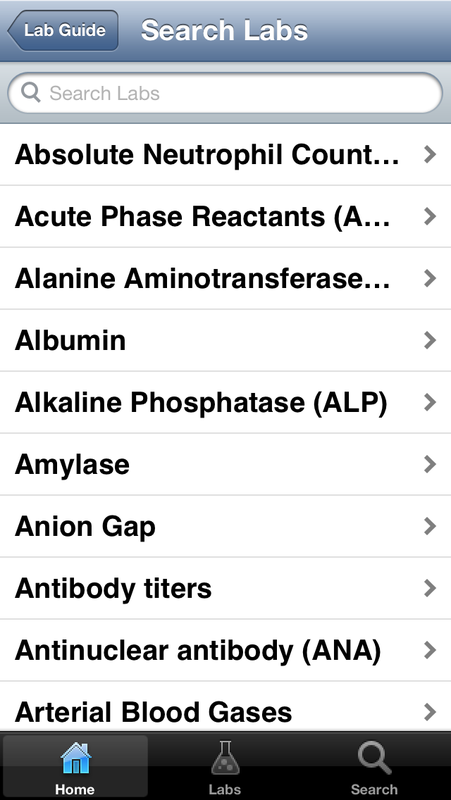 From the main menu, users can either view the lists of labs, search the list, or read more about the app and its creation. 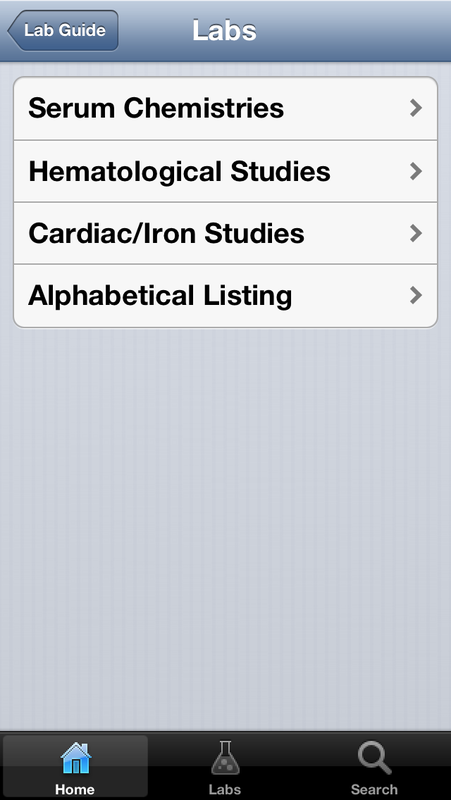 Tapping Labs will take the user to another screen, in which the labs are categorized by Serum Chemistries, Hematological Studies (pretty much everything in a CBC and differential), Cardiac/Iron Studies (cardiac biomarkers, ferritin, TIBC, transferrin, etc. ), and then an alphabetical listing of all labs. After selecting a specific subgroup, the user can then peruse individual labs. Under each lab, the lab name is given. A normal range, followed by an explanation of what the lab value means, and information on how to interpret the results is also given. The formatting could use improvement on these sections. Because they are written in a chunky paragraph format, the information is hard to parse without reading each entire section. Bullet points may be a better way to express the information. 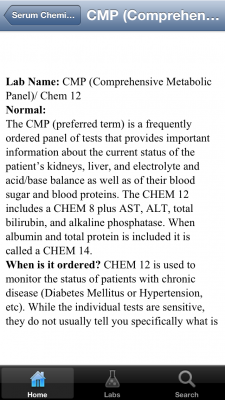 The app also attempts to explain some lab tests in their entirety, such as a complete blood count with differential, or a complete metabolic panel. In these cases, the components are listed, as well as information on when doctors would order these specific tests. The formatting needs to be corrected on some of these as well. For example, the “Interpreting the Results” section for CBC and differential is blank, when it should have just been omitted for a cleaner look. Users may also search through the alphabetical listing by selecting Search from the app’s main menu. This app is extremely valuable for medical trainees learning how to interpret basic lab values and deciding when it is appropriate to order them. Each lab is accompanied by just enough information for students, and a decent differential for causes of high and low values. However, there are some important omissions. 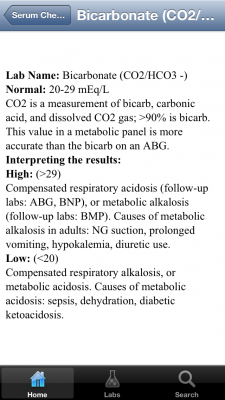 This app does not at all comprise a comprehensive list of lab values, including only very basic ones found in the comprehensive metabolic panel and complete blood count, and little more. For example, hormone levels, cholesterol levels, and tumor markers are not included. Even magnesium and phosphorus are missing. Lab Guide is a useful introduction to basic lab values for students and residents, providing clear explanations for each lab and appropriate differentials. However, it is important to note that it is not a comprehensive lab values guide, and could use more improvement in formatting as well as content. Yes, though it could definitely be improved. Very good stuff, would go a long way informing and properly directing laboratory professionals. Updates and certain specification of regional differences should also be indicated.